Creating technologies, products and markets. A long tradition of innovation in office products has made us one of the leading engineering teams globally in image, audio, and document processing and recognition. But although having genius engineers is good, what sets us apart is our teams go out to the frontlines, witness the big unresolved problems that individuals are experiencing every day and resolve them – this is where great things happen. Creating technologies, products, and markets in a streamlined fashion is what we are good at. 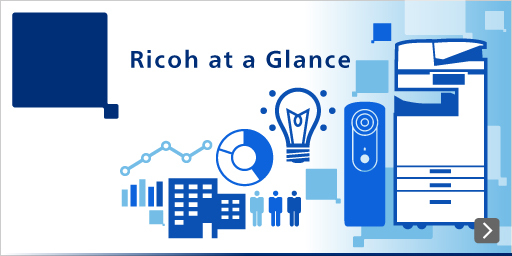 Ricoh has state of the art device technologies such as optics and ink jet, which have been continually augmented given our first-hand experience in the office products market. We are committed to continually creating unique technologies that combine our devices and Information and Communications Technologies (ICT). Human-friendly healthcare technologies, earth-friendly green technologies, and society-friendly material and device technologies. Excavating the seeds of technologies and producing new businesses—that produces the dynamics of research and development. Join us in opening up the future with innovative ideas and dynamic agility. The Advanced Printing Technology (APT) Institute focuses on printing technologies that leverage those that have been nurtured by Ricoh since it was established in 1936. It focuses particularly on technologies that relate to materials, processes, optics, visualization, and modeling. The institute conducts research and development in order to apply these technologies to new alternative applications (e.g. medical treatments and batteries) leveraging both Carlson electrophotography and inkjet processes. The institute’s primary asset, printing know-how, is also its core competence. In collaboration with the market, the institute will address current trends and social demands and will strive to make a greater contribution to society.